Having fun in drama. 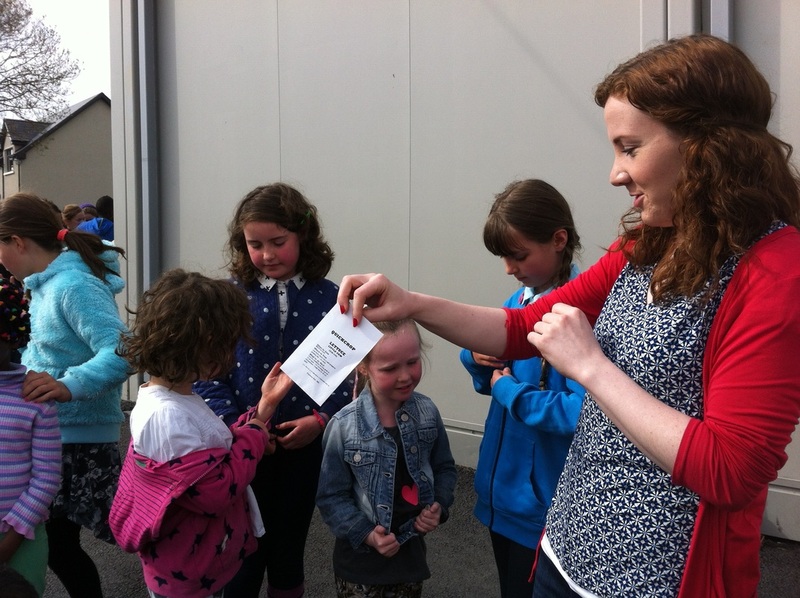 The children had to pretend to have a little thing in their hands. 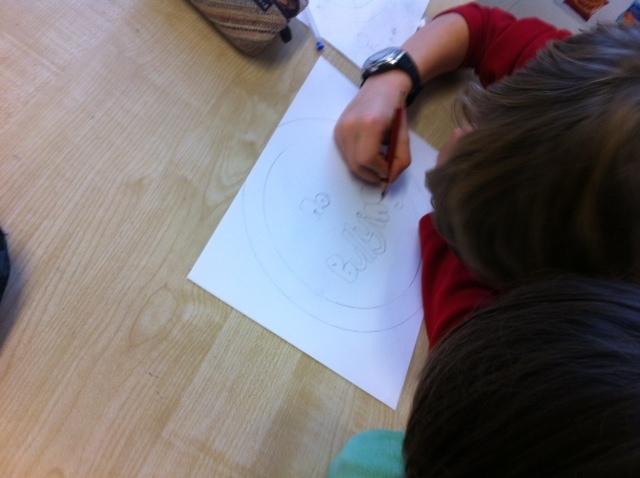 We had lots of great ideas including a hamster, a hot potato and a butterfly! We had an Irish dancing workshop. 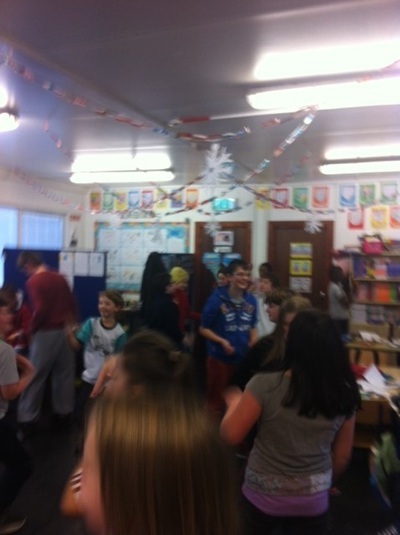 Aibhlin and Cathal from 5th class dances for us and Sorcha's sister Roisín showed us her dance too! 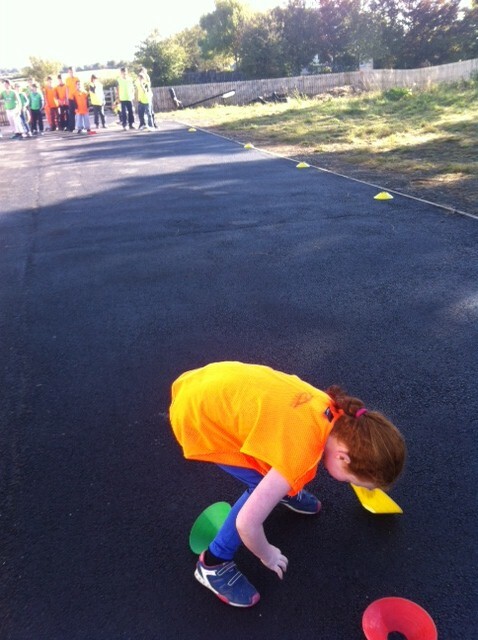 then we all tried some of the steps! Here are some of the entries for The Song of The Sea competition. Although we didn't win, the boys and girls produced some really beautiful pictures and we enjoyed watching clips from the movie. 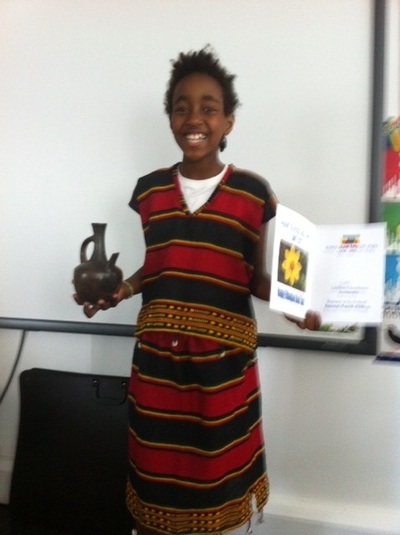 We had great fun on our school tour. We went on a Viking cruise on Irelands longest river, The River Shannon. We really enjoyed the bowling and soft play afterwards and even fit in a bit of shopping in Athlone town! We really enjoyed our water safety talk. David Sharkey from Irish Water Safety told us how to keep safe around water, at the beach, in the pool and on farms. Free Art! The boys and girls practised their sowing on hessian fabric. they also experimented with some painting techniques such as spatter painting and blow painting. Vera from The Marine Instutue came in to talk to us about mapping the sea bed. She was on the voyage of The Celtic Explorer which has been collecting data about the Atlantic sea bed. 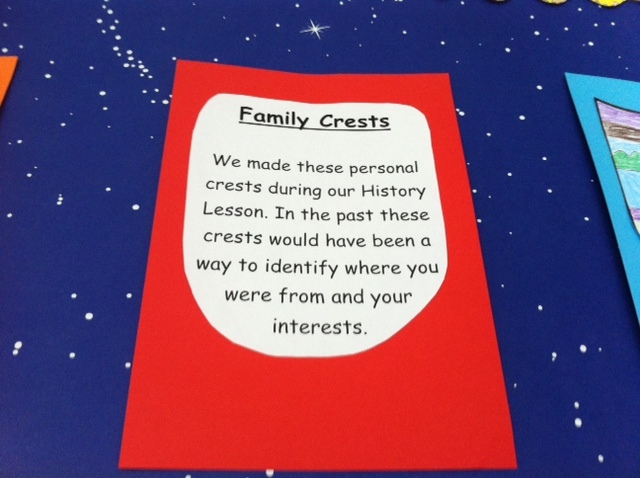 We really enjoyed finding out about this and asking questions. 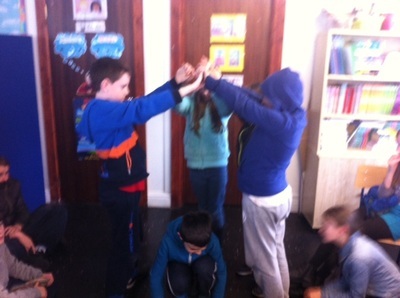 Raymond Stephens is a nature expert who works in Coole Park where there is a bat house. He told us all about bats and answered a lot of our questions. We looked at machinery that picks up bat sounds in the area. We got to hold dead bats too! A big thank you to Raymond from all the boys and girls in 4th class. 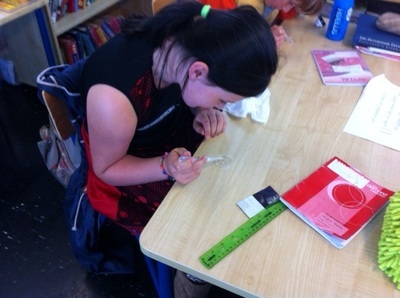 Testing for the presence of starch using iodine. 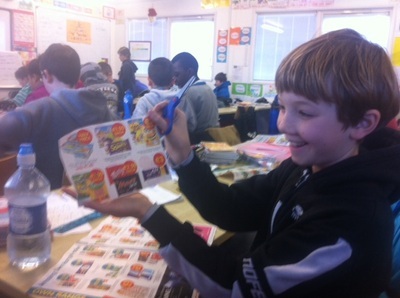 Examining the effects of vinegar and cola on an egg. We tested the turbidity ( amount of particles in the water) of water samples from our local area. 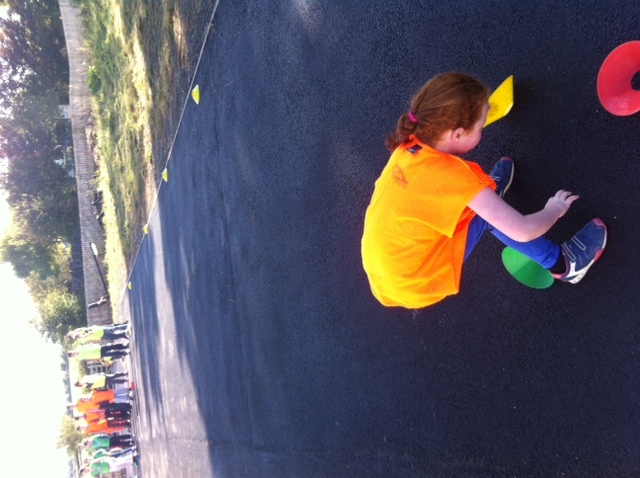 Thank you to Aoife Hughes who brought in the interesting equipment. We really enjoyed it! The boys and girls painted beautiful Viking Shields which are now on display in our classroom! 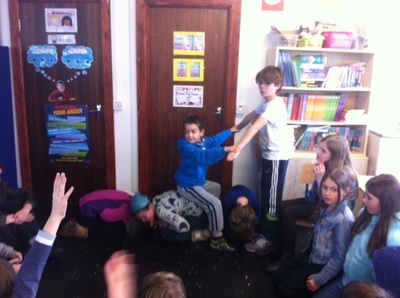 We enjoyed using the drama technique, "Conscience Alley"
The boys and girls had great fun doing tasting tests, blindfolded! We tasted a variety of fruit and vegetables including carrot, cucumber, celery, mint, tomato, pepper, orange, apple, kiwi, lemon and lime! 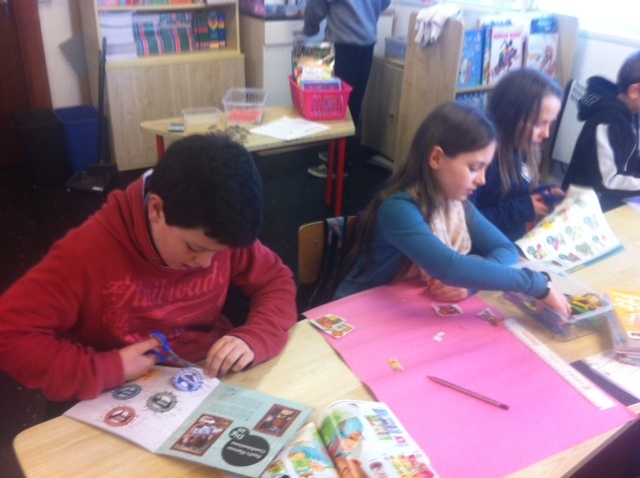 We learned about how we taste are food and also studied the digestive system. 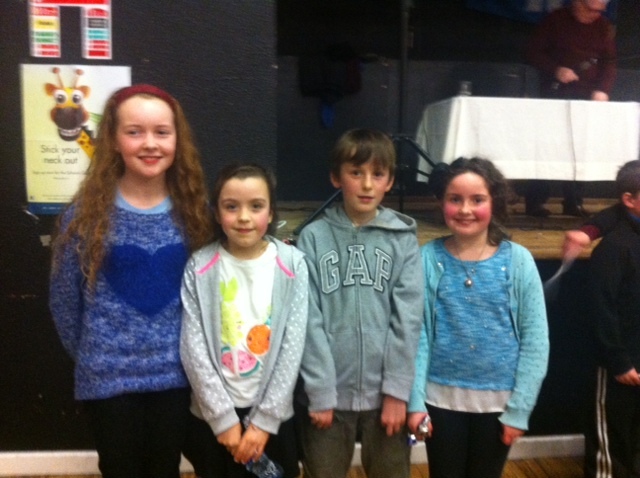 Well done to the boys and girls who represented their school at the Kinvarra Credit Union quiz! 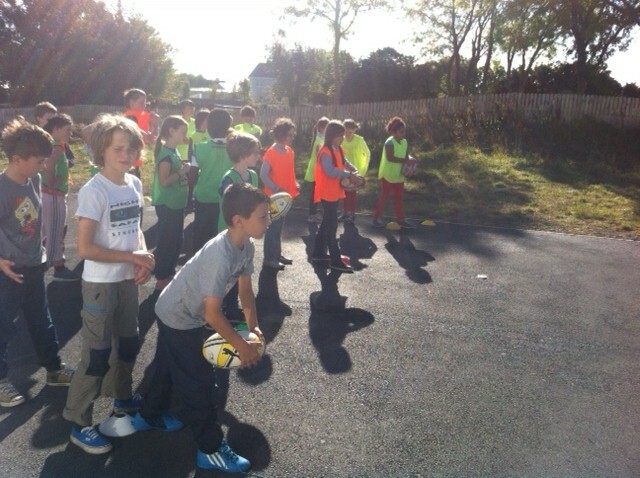 An experiment to find your blind spot! Also an experiment using a small torch to watch your pupils dilate! We have been learning about length in maths recently. The children estimated and measured a variety of items inside and outside the classroom! 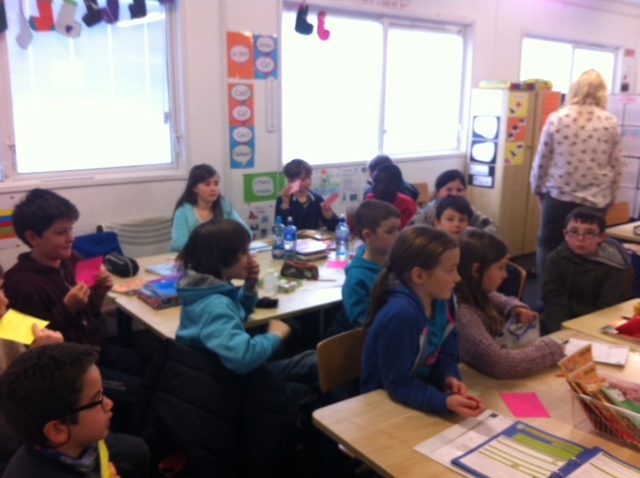 Pauline is from France and she visited our class to tell us about her home town in France. It was great fun! ﻿We are learning about healthy eating at the moment. 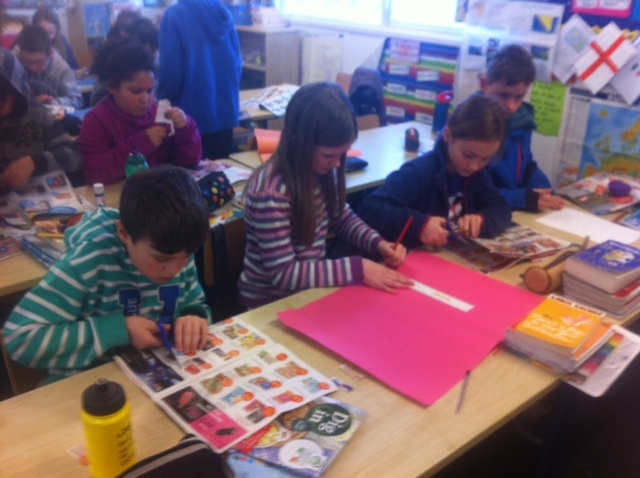 The children created food pyramids by cutting out food images from supermarket catalogues. We have begun reading our class novel, "There's a Boy in The Girls Bathroom" by Louis Sachar. 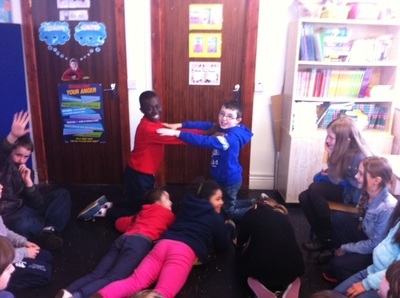 We were reading character roles in groups today. 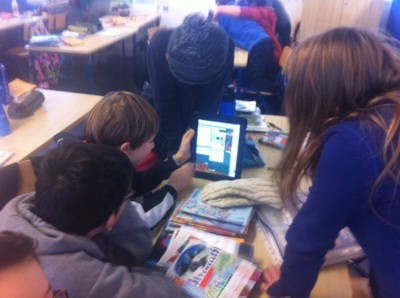 We use I Pads for research. We are learning about the vikings at the moment. 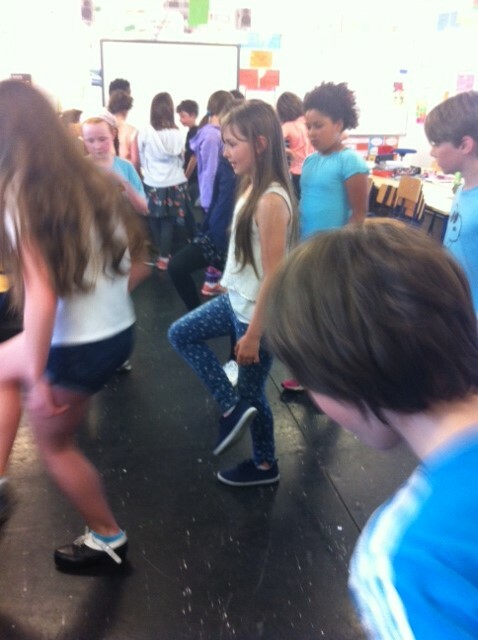 The boys and girls in 4th class are brilliant dancers and they choreographed their own dance to Daft Punk's song "Around the World". We love to dance! 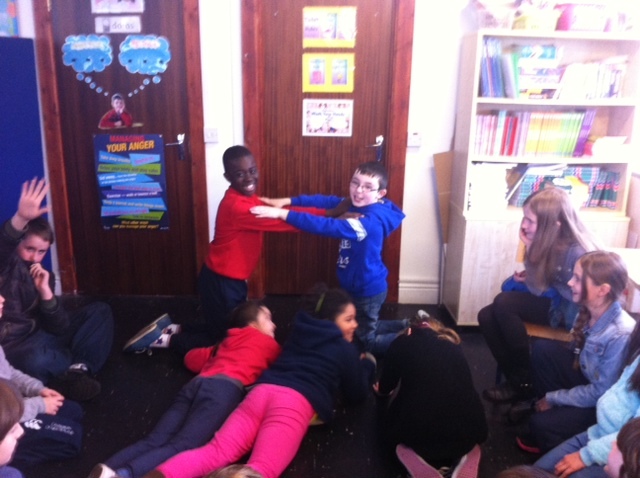 ﻿We were learning about light as a form of energy in science. 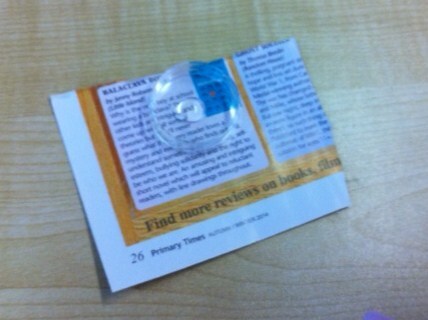 We investigated light sources and recorded opaque, transparent and translucent materials in a table in our copies. 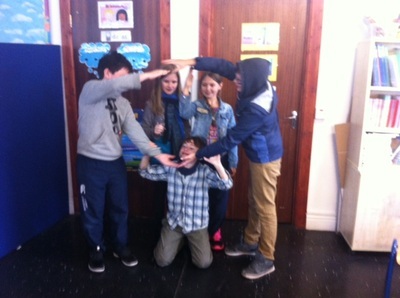 Bhí an aimsir go dona agus bhí na páistí istigh ag am lón. 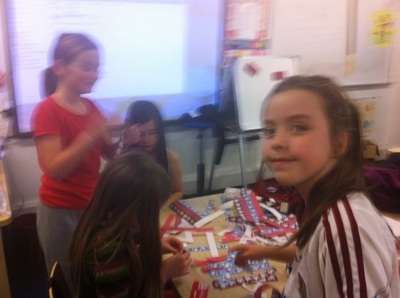 Rinne siad míreanna mearraí le cheile, maith sibh! 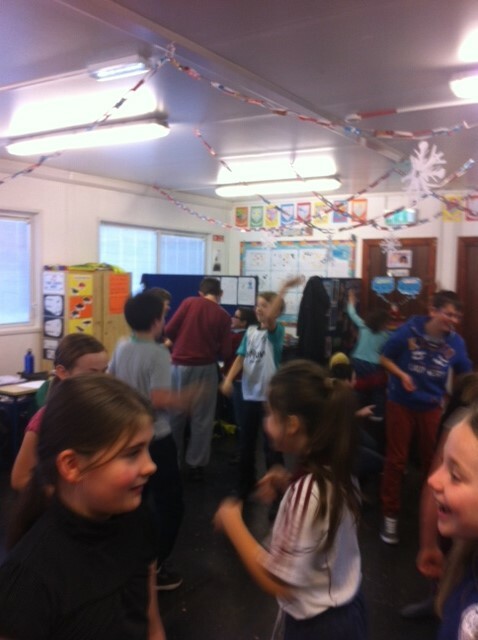 During the bad weather the children stayed in at break time. 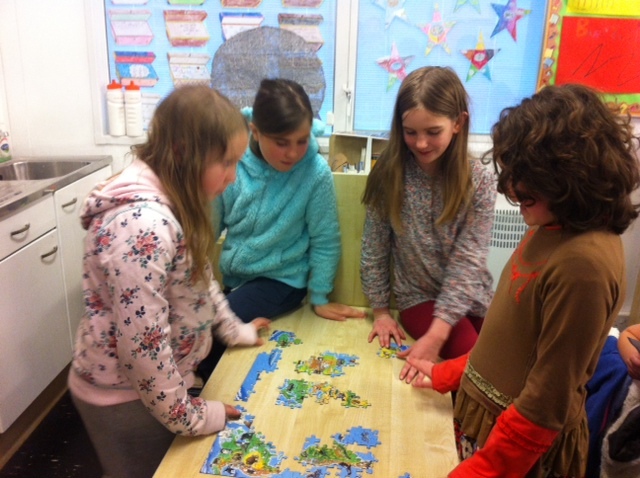 Well done to then for making these jigsaws! We began debating this month. Aaron and Rowan acted as judges and we debated whether wild animals should be kept in captivity. 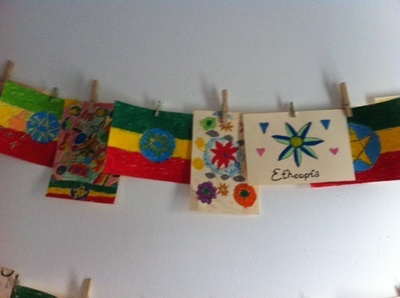 ﻿Making decorations for our winter exhibition. A big thank you to Deidre Bennet who helped us to make lovely wreaths. 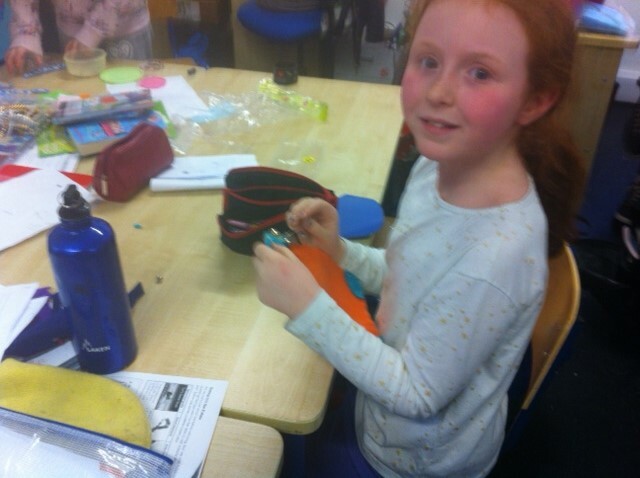 We also made felt stockings and prints. 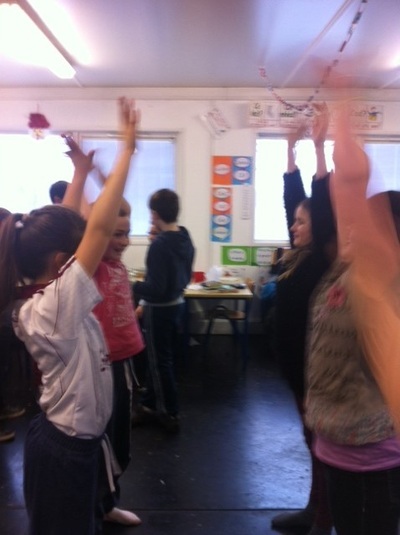 Well done to all the boys and girls who took part in The Young Voices Concert in Dublin last Friday night. Bhí sibh go híontach, maith sibh! The choir will be performing all the songs from the concert at the K.E.T.N.S Winter Show on Friday 12th December at 6.00pm. 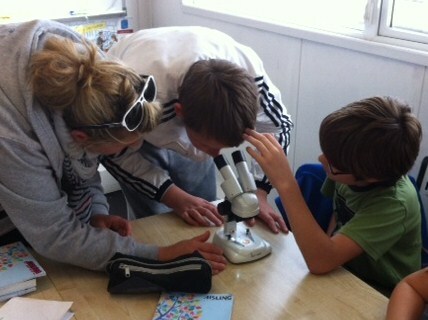 ﻿We really enjoyed using the microscopes in our class over the last few weeks. 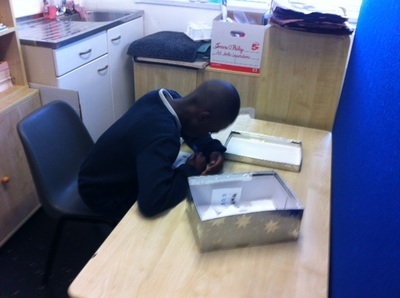 We collected our own samples from our school environment to create our own slides. We also looked at an onion sample under the microscope and drew diagrams of the onion cell in our copies. 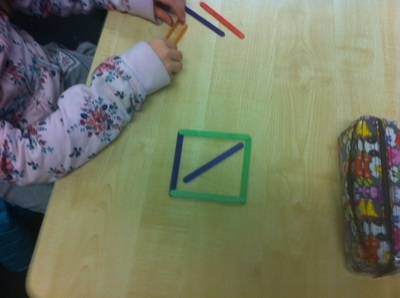 We are learning about lines and angles in maths at the moment. Here we are making right angles and showing vertical, horizontal and diagonal lines. 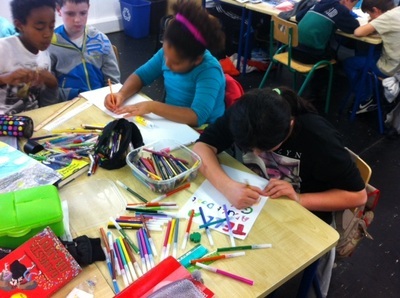 ﻿﻿The children made anti-bullying posters to be displayed in school. 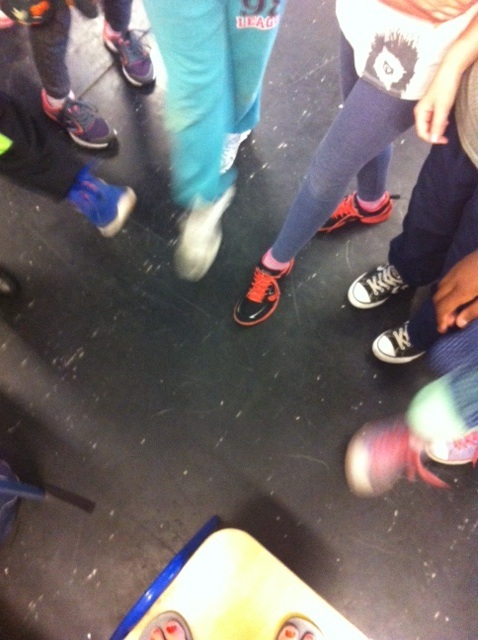 we discussed different types of bullying and figured out ways to resolve it. 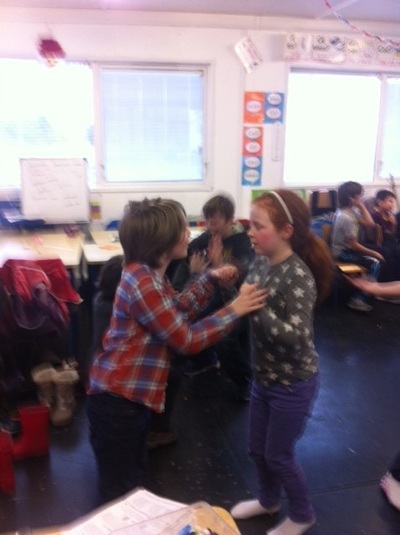 ﻿﻿﻿﻿﻿﻿﻿Our class really enjoy drama and we created a drama contract to ensure that we all get to enjoy our drama lessons. 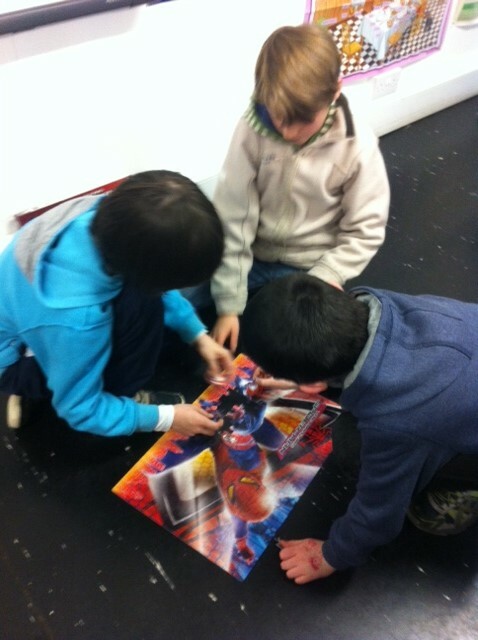 In these photos the children are making objects such as cars, clocks and computers with their bodies! Bhí "Bia" mar téama againn le deannaí. 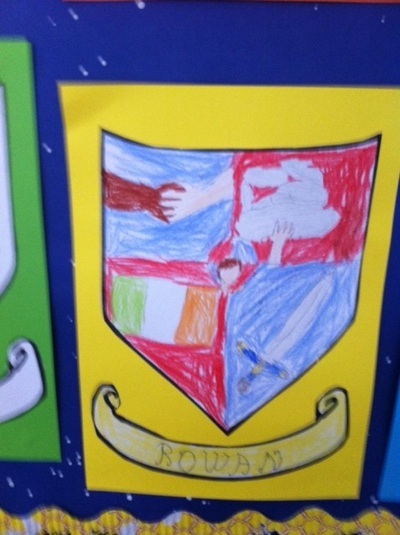 Rinne na páistí biachlár blasta agus bhí bord bia againn. Rinne na páistí dráma sa bhialann agus bhí an-chraic againn! 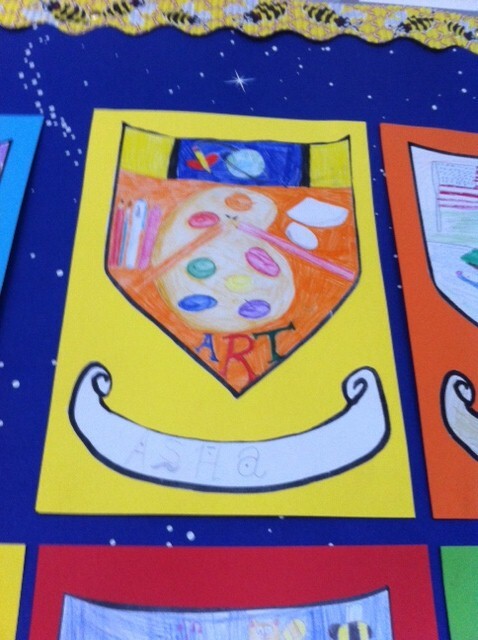 The boys and girls have been very busy preparing all their artwork for the winter show the last few weeks. A big thank you to Cindy Lund who has been helping us with our printing projects this term. As part of maths week 4th class helped senior infants to use real money to buy things in our school shop! 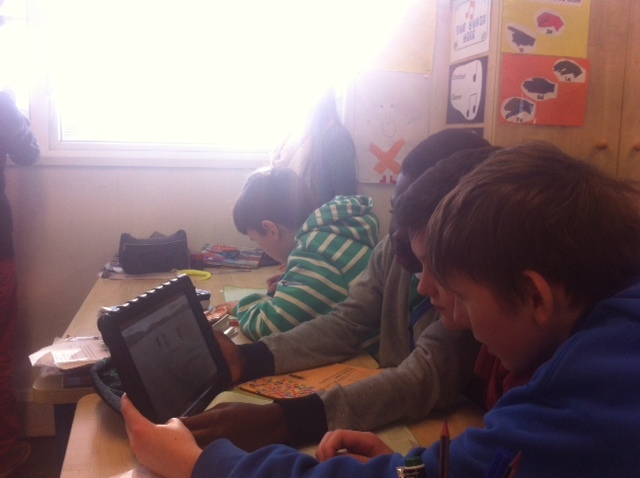 We also did a maths trail around the school and made videos of maths in our environment. 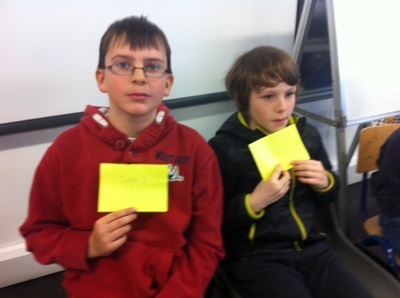 A big thank you to Deidre Bennet who came in to talk to the class about using maths in her work. 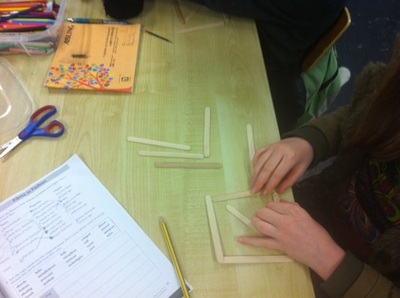 We investigated how maths is important in many different jobs. We had a great time in Galway on our school trip. As part of Babaró we went to see a show called "Tales of a Yellow Town". 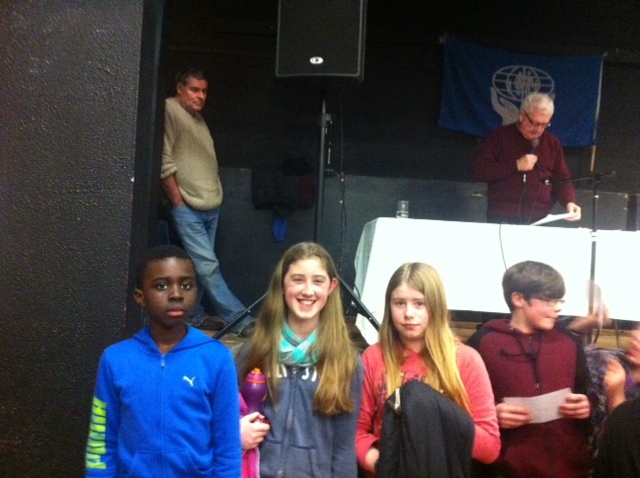 It was about the Brazilian community in Gort. Then we went to N.U.I.G to have our lunch. 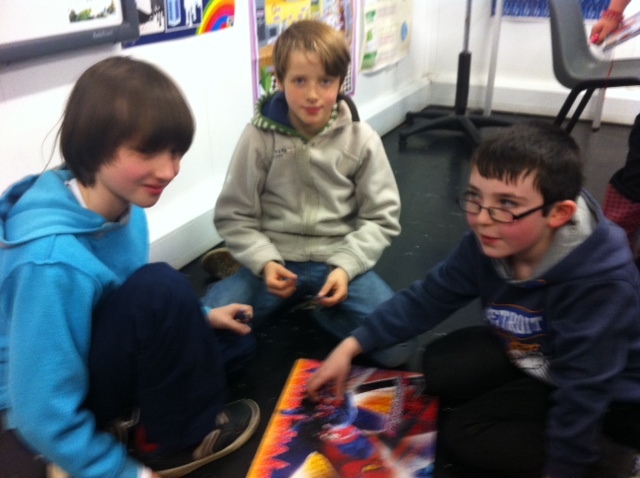 After that we went to The Galway City museum and saw a marine science exhibition. 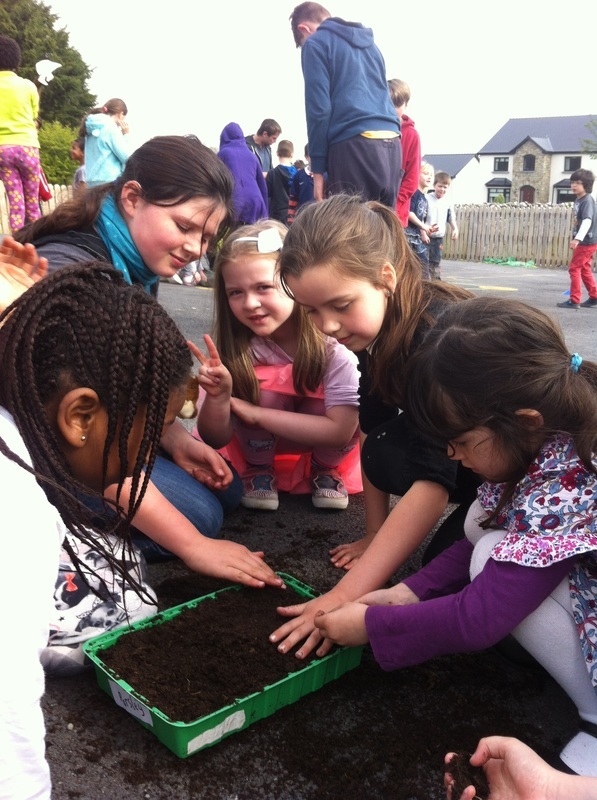 As part of Tree week we did some planting in our school garden. We cleared our patch and picked some spring onions and parsley which we ate in an omelette the next day! We planted bulbs. 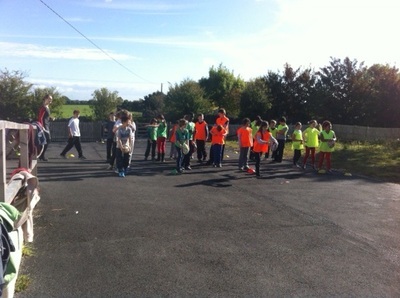 We also went on a nature walk with 6th class. 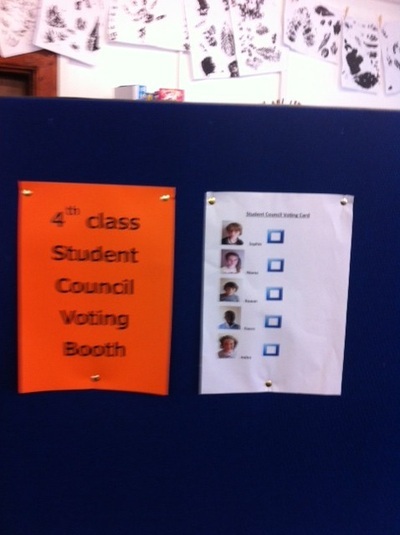 Following our class elections for the student council, Indira and Rowan will represent Fourth class on the council. Well done to all the candidates who ran. 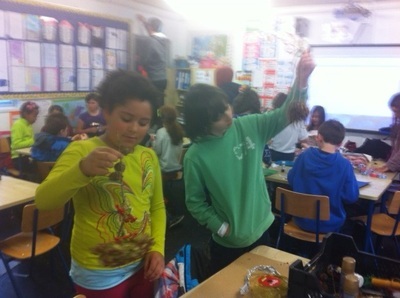 We learned about the Bronze Age in Ireland and planned and made a Bronze Age Settlement! We played Tip rugby with David Stewart during P.E, it was great fun! 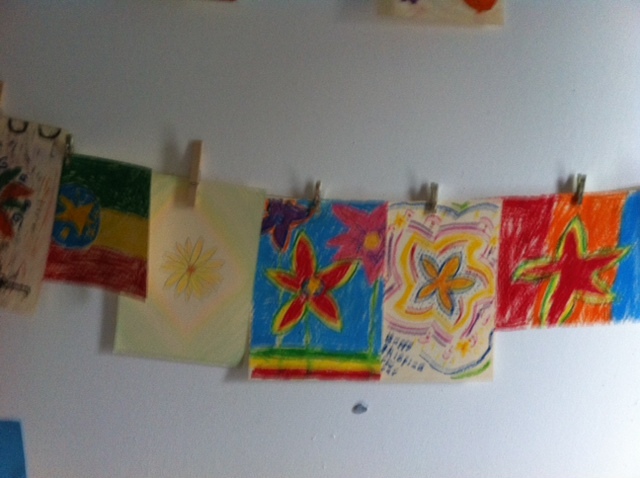 Printing Art with Cindy Lund. We used leaves to create these lovely prints!